We are once again visited by the Warlock’s Journal, the travelling book of wonderous knowledge. This time the Warlock’s Journal is focused on very specific and mysterious topic, True Names! It is known, that throughout the ages, the eons and the multiverse there has always been one universal truth which seems to have unparallelled powers of domnation, the True Name! But the Journal is apparently focussing it’s attention on a specific example in history where a beings true name was discovered and used to subdue and force it’s wearer. It seems it is keen on knowing where the name had its origin, how it was hidden and how it was discovered. Which are questions that some of our greatest minds have been trying to answer for millennia, will the Journal succeede where they have failed? To enter the May contest of the Warlock’s Journal, you must create a True Name entry for the Journal. 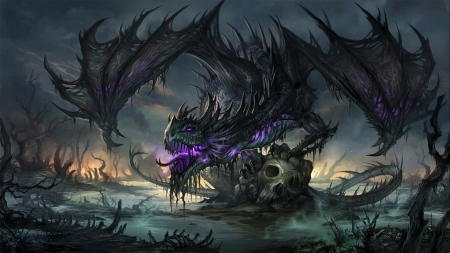 The Nel’Dratha Queen was once a dragon mount & familiar of a powerful wizard. She transcended her immortal form as dragon and turned into an undead shadow dragon, over time she had followers who wanted to become what she was. Eventually she became a demigod and these days, it is rumoured that she is actually a living plane of existance. A living Necropolis. Her True Name was discovered by the Shadow Council’s proxies and they used it to force a location from her. for more information about the Shadow Council and it’s proxies, read the Shadow Council Essential Origin stories. lastly how the Shadow Council’s immortal proxies managed to figure all of this out. The design should be void of system specifics, such as stats and mechanics. These can be added as a bonus appendix if you like. Submit your entry to gork@tinygork.com with the subject Warlock’s Journal by the 29th of May 2016 to participate in the contest, the winner gets a free bundle The Lost Page handout bundle by TinyGork. I am going to twist things abit this time around, there will be no public voting for the winner. This time I will choose the winning entry, the contest subject matter is the Shadow Council Origin story which i am currently working on as such i want the winning entry to be the one that resonates most with me and my understanding of the Shadow Council. Prize:The Lost Page handout bundle as well as the possibility of the entry being used in future Shadow Council publication by TinyGork. Max 1000 word limitâ€š Name/Title does not count against word limit. Voting: This time around I will personally select the winning entry. Once the contest is closed and I have gone over all entries and selected a winner, all will be compiled in a pdf for free download. Further notesâ€š and detailsâ€š may be added to the pdf. The PDF will be announced with download links on Tinygork.com and the winner will be announced in the PDF. The winner will be contacted directly by TinyGork with details on how to obtain the prize. All contestants will be signed up to a mailing list that informs of future Warlock’s Journal Contests. Important Note: Entries remain the property of their Creatorâ€š but entry into the contest grants Michael Christensen and Tiny Gork a licence in perpetuity to use the entry. This licence will allow the publication of the entry in one or more free and/or commercial pdfsâ€š where work will be attributed. Entries May subsequently be expanded upon or otherwise developed for future contests or products.